Staying at the top of your industry requires constant investment, a methodology that Barnshaws Section Benders is applying with the introduction of a new high capacity induction bending machine. Already considered the world’s premier section bending company, Barnshaws is now offering customers induction pipe bending up to a size of 32” from its headquarters in Tividale. The new capacity has been added to further support end users in the oil and gas, structural and machinery markets. Induction bending offers an advantage in the fact that it reduces many of the problems usually associated with cold bending pipes, such as wall thinning and distortion of the section. Instead, a coil heats a focused area of the pipe, and immediately afterwards cold water is applied to cool the newly curved shape. This results in a tube bending process which allows tight radii to be achieved without compromising the integrity of the pipe. Preserving this internal profile on such a large scale is ideal for end users. Sections with consistent internal profiles can be used on pipelines as they do not constrict flow, whilst also minimising welding requirements. This is especially important for end users, as eliminating fabrication steps provides an expedited solution. As well as tackling large pipes, Barnshaws can also offer the same induction pipe bending service down to 2” sections. Furthermore, due to the versatility of the process, multiple bends can even be incorporated on the same section. This can include different radii if required, allowing end users to specify the perfect pipe section for their needs. Full traceability is offered as standard, as well as all relevant certifications. The new machine represents a large investment for Barnshaws. Increased demand for precision curved steel tubes has pushed the business towards expanding its operational capacity, which is already supplemented by some of the most specialist bending machines on the planet. This inherent bending capacity means that Barnshaws customers can expect shorter lead times on orders, as well as improved capability. 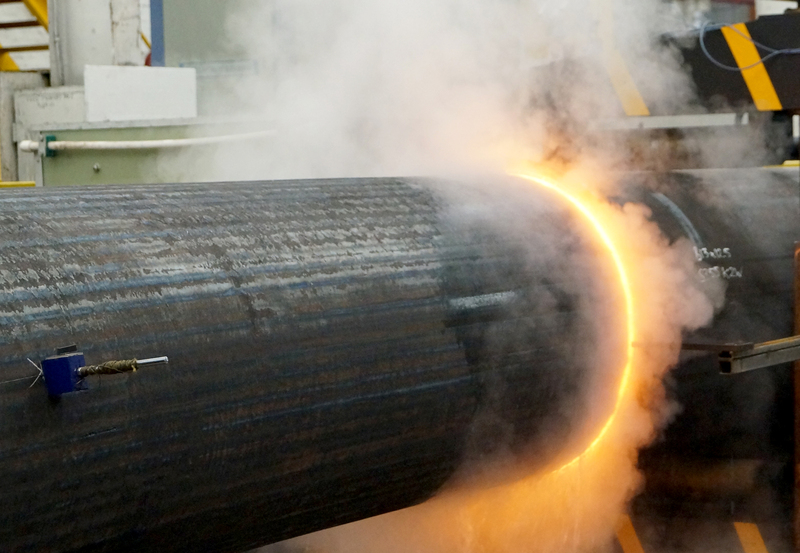 Enhanced capability now means that Barnshaws can easily take on tube bending for larger pipeline projects, which are prevalent in the oil and gas sectors. Photo Caption: Barnshaws is now offering customers induction pipe bending up to a size of 32” from its headquarters in Tividale.